Touch screen devices are all over the market. Specially when it comes to tablets which are right now being sold like hot cakes. The truth of the matter is touch screens are good for navigation, surfing around the internet and a little bit for short email responses, for the heavy duty typing its just not very useful. For the people who write content or type a lot it is just very difficult to use despite the fact tablets can be really handy for bloggers to write stuff on the move. The only answer to the problem is Portable keyboards. Scosche is a company that specializes in car audio installation and other electronic accessories, its also an Innovation Company. Ok nuff said, getting to the keyboard. Its one amazing piece of accessory i have come across. 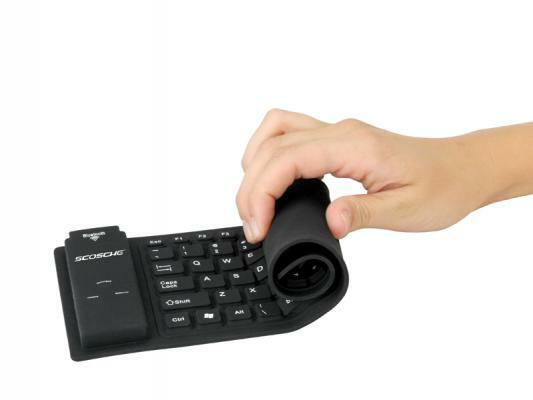 The keyboard is flexible and water resistant, made out of silicone material. Its designed to be rolled up like a mat making it ideal for travel and storage. The Dimensions of the keyboard are 12.4" x 4.44" x 0.43"
Its compatible with many popular devices like iPad, iPhone, iPod touch, Android tablets, smartphones, net-books and other similar devices. The keyboard connects via Bluetooth or USB. The Mini USB doubles up as a charging port. The batteries and the ports are encased in a little package in the left side of the keyboard. The keyboard is priced at $59.99 and can be brought from the official site .